It's not just about gardening here. Ok, it's mainly about gardening and occasionally something non-gardening related sneaks in; it is 'and other musings' after all. This is one of those times. Like many gardeners, I have more strings to my bow than just gardening, and something I spend a lot of time on is campaigning with Global Justice Now (formerly World Development Movement), and over the last nearly 6 years I've also been on its national Council and Executive. It's been a role that I've both enjoyed and learned from, including how a democratic activist organisation is run and being a part of managing and developing its overall direction. My reign of power comes to an end at the June AGM (sob), and Global Justice Now is looking for new people to join its Council. So I've written a little article about it and it would be great if you could take a look. The intro is included below, or you can go straight to the full article on the Global Justice Now website. I'd like to live in a world where I don't have to keep campaigning for social and economic justice and can instead spend more time in the garden. That will only happen if more people join the movement and together we bring the change we want to see. 2015 is election year for Global Justice Now. 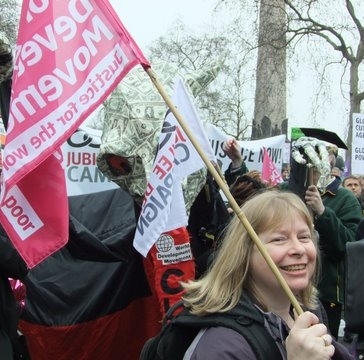 Taking place every three years, council elections determine the governing body of Global Justice Now, which is made up of a range of people including recent and long-term supporters of the organisation and activists from local groups. Now, before you think this isn’t relevant to me – STOP - yes it is, and we need your voice on council. The heart of Global Justice Now is its members and local group activists. I’ve been a member of Global Justice Now since about 2001, and over the years I have campaigned on issues from GATS to food speculation. I have helped put on public meetings, lobby MPs and MEPs, run stalls, taken part in demonstrations and campaign stunts, set up and run group websites and managed social media activities. I’m saying this, not because it’s unique, but because it’s an example of what a lot of you reading this will have been involved in too. It's always good to have another interest Julieanne - yours is very worthwhile. Off now to read your article.